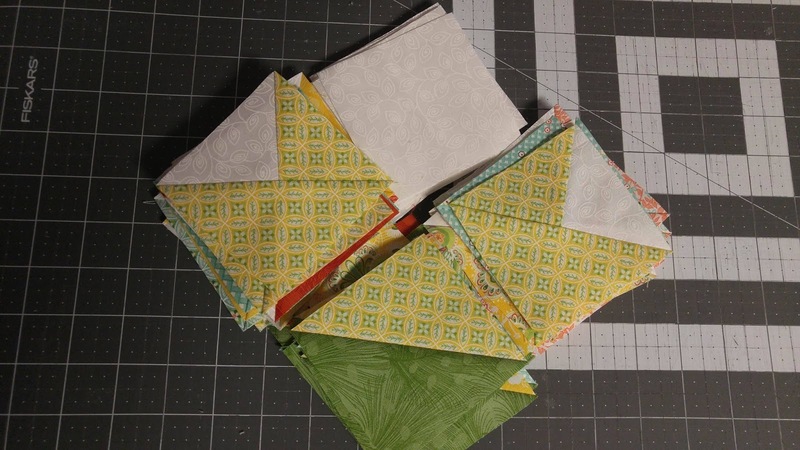 It's time for the second challenge for Project Quilting! 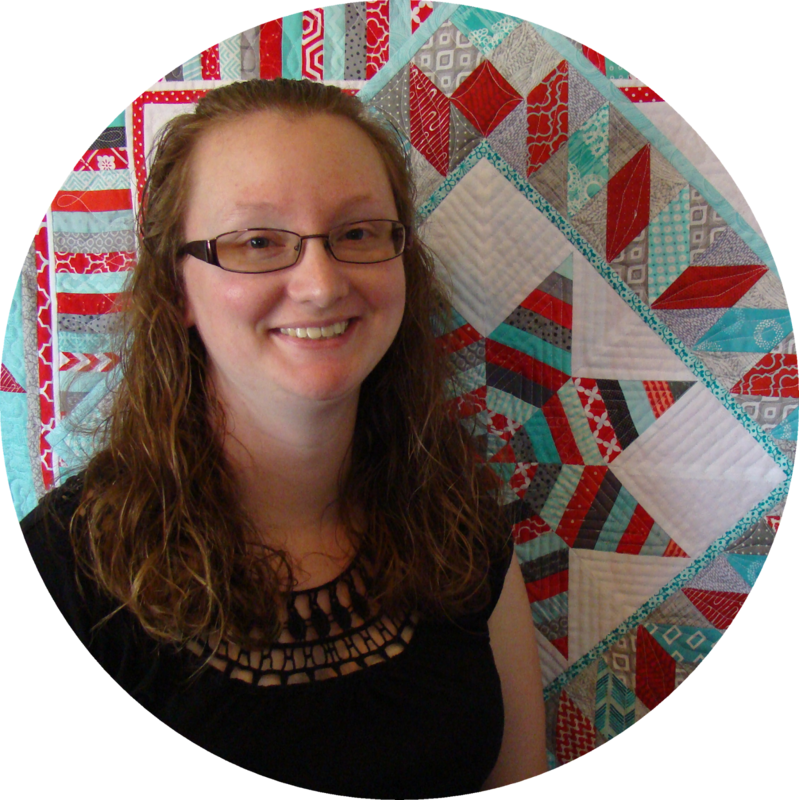 This week's quilt is the largest one I've done for a Project Quilting challenge! This week the challenge prompt was "Carolina Lily." 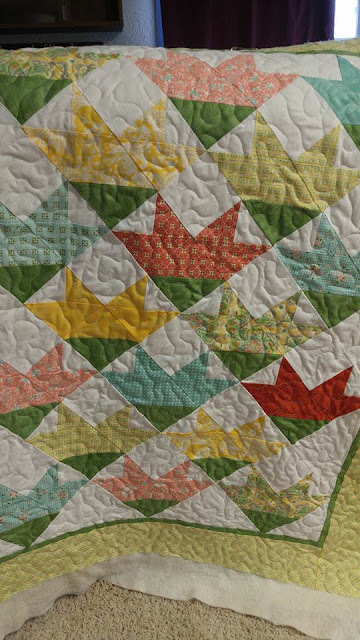 The Carolina Lily is a beautiful flower similar to a tiger lily, and it is also a traditional quilt block with flowers and stems. I spent a few days thinking of what I might like to make, but also had several other quilty things going on this week, so I knew my time would be limited. This ultimately made me scrap reschedule until a different time my favorite idea. 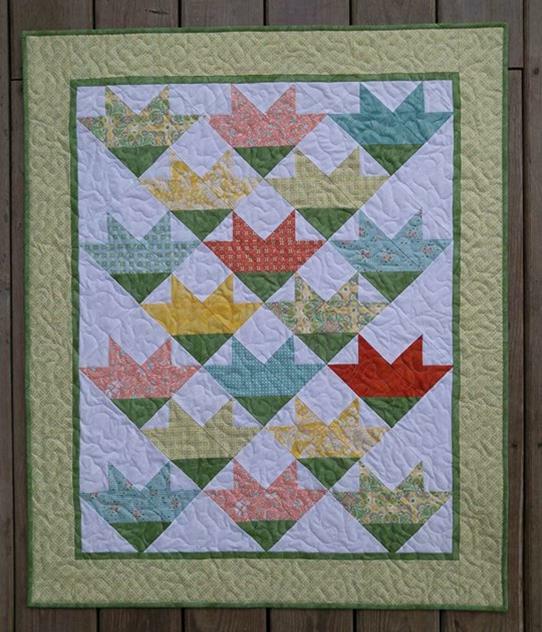 My second choice was inspired by a quilt I found on Pinterest called "How Does Your Garden Grow" by Sarah Fielke. I knew I had fabric in my stash that would work great, so this started my new plan! I messaged Sarah about a pattern, but in the end, I needed to make the blocks in a different way in order to be more efficient with the time I had this week. I drew out my own design on graph paper and did some quilty math to come up with a baby size quilt plan. I chose fabric from the line "Flora" by Lauren and Jessi Jung for Moda. 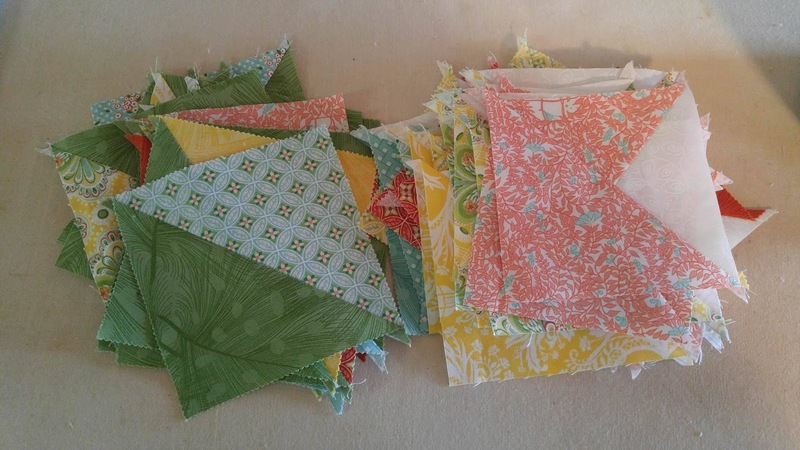 I've been saving hoarding some of it since making the "Bloom Where You Are Planted" quilt for my friend back in 2012. 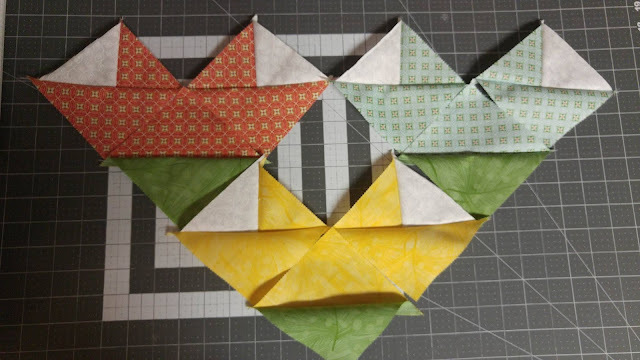 Wednesday night I made a few test blocks to see if my method would result in the size of block I wanted. 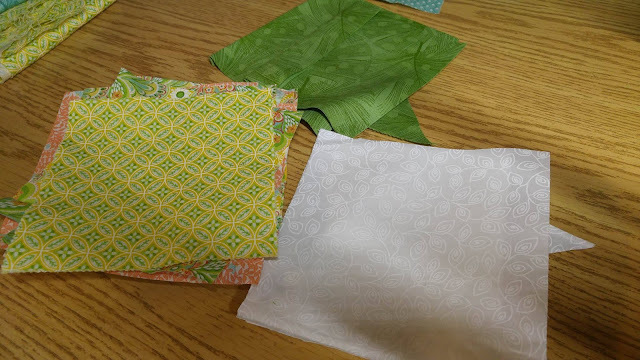 Thursday morning, I cut all the fabrics and got started! I sewed for 5-10 minutes every time I had a chance all throughout the day. Dishes. Sew. Laundry. Sew. Exercise. Sew. Homeschool. Sew. Eat. Sew. The white fabric is a white on white floral. 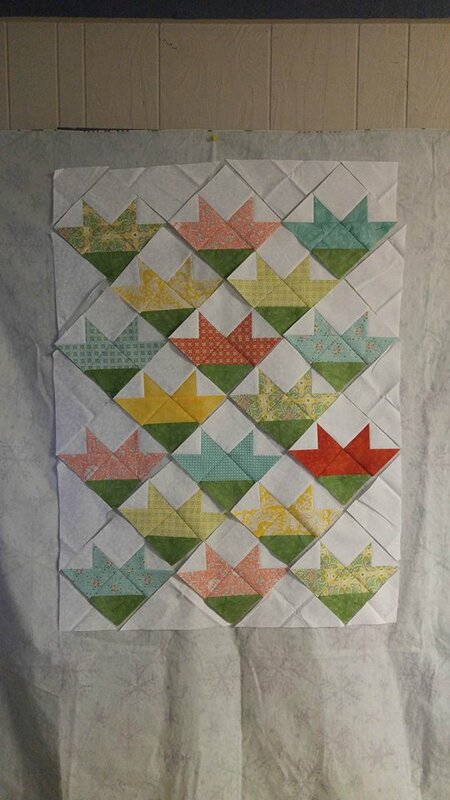 It is the white that I used in the original "Bloom" quilt too. 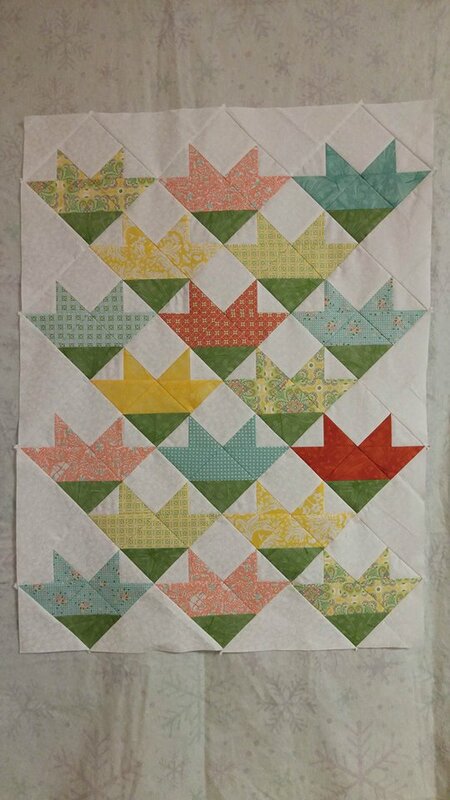 I ended up cutting the setting triangles a tad too small, but didn't have enough of the white on white fabric to recut them. 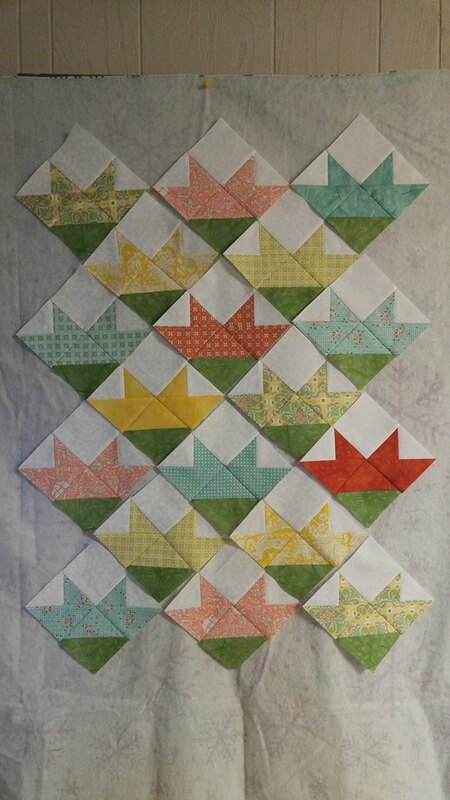 In the final quilt, most of the points are cut off around the edges due to this. I made most design decisions as I went along. I tested out different border options and decided to cut the extra white space off the blocks at the top. 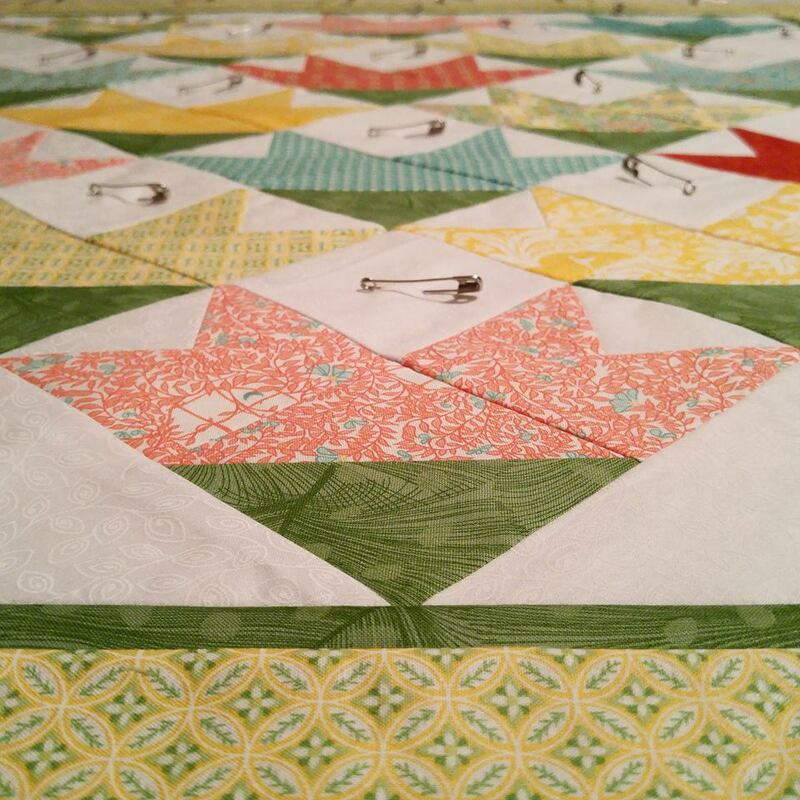 By supper time, I had a finished quilt top! 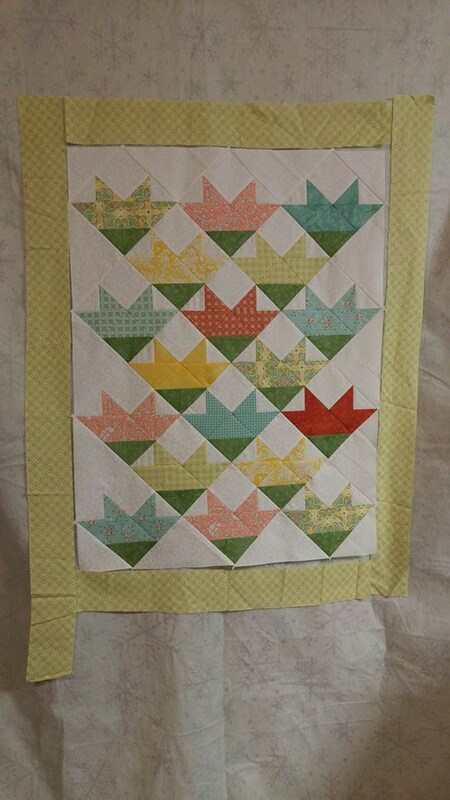 I pin basted the quilt Thursday night. 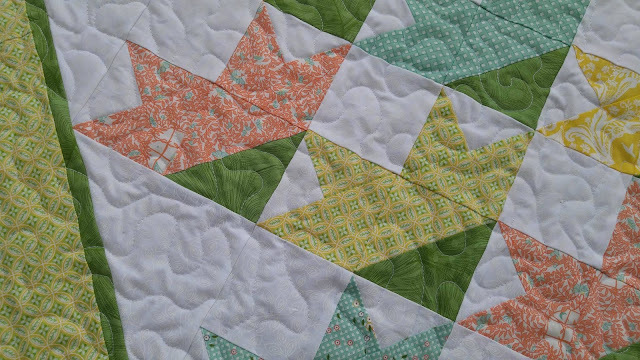 Then Friday morning, I quilted it. I free motion quilted a stipple design using my vintage Bernina Record 930. Binding was on before lunch! The finished quilt measures 32" x 38". 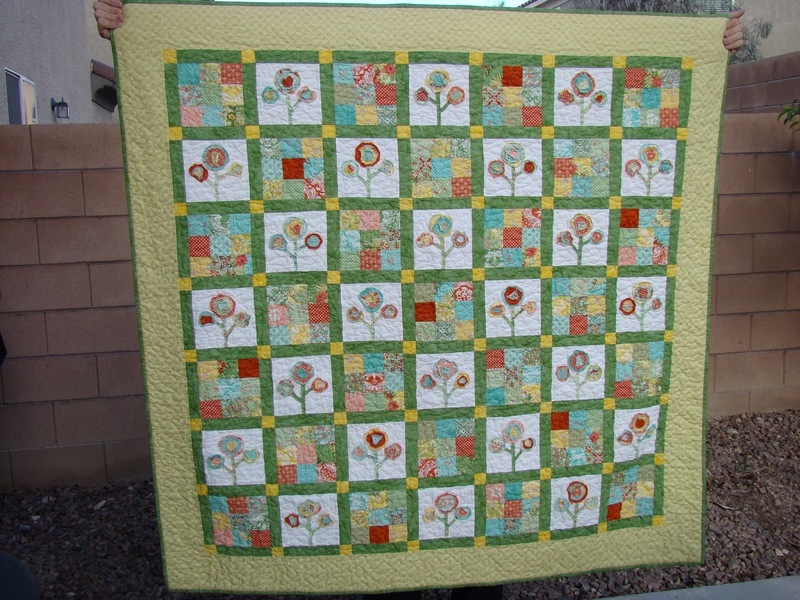 I'm calling it "Baby Blooms" - as it is a baby size quilt that coordinates with the "Bloom Where You Are Planted" quilt. 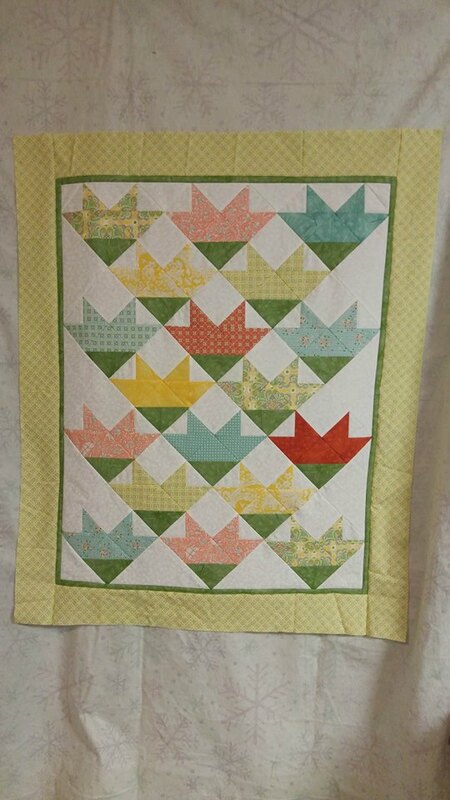 Pieced and quilted by yours truly at my home in southwest Missouri. 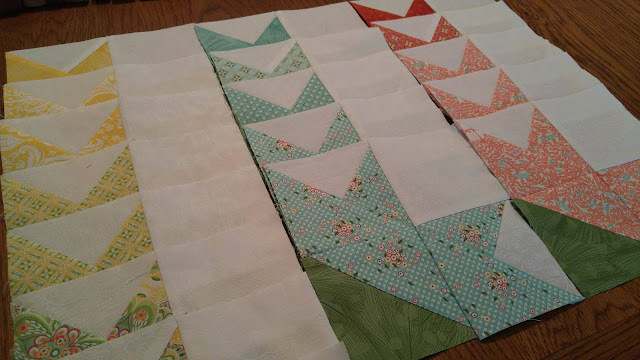 Also linking up with Finish it up Friday at Crazy Mom Quilts and Finished or Not Friday at Busy Hands Quilts! Very pretty - and very quick! 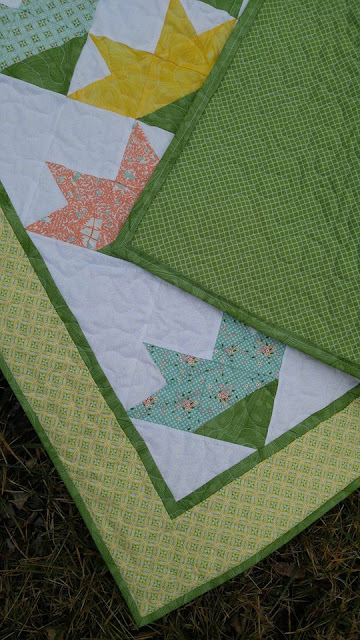 Love this pretty quilt, what a great pattern. I love that you designed your own block for the quilt. It's beautiful! Really beautiful use of the fabric. 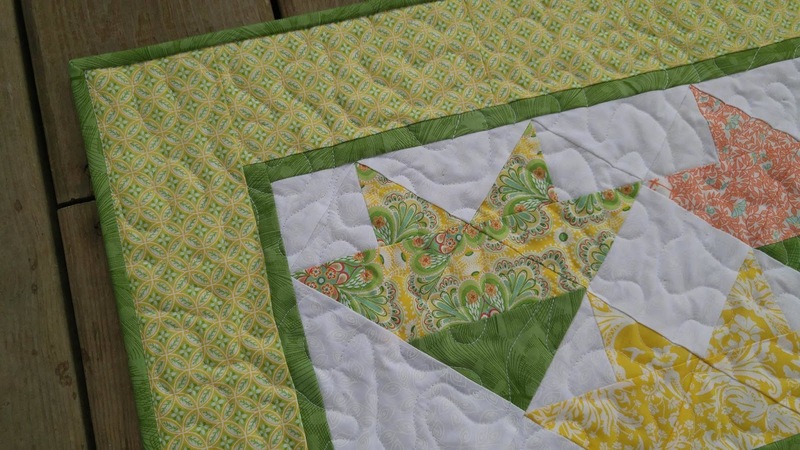 I particularly like the shade of green in the binding and border. Oh yes. I would make this and love it too. This turned out lovely! 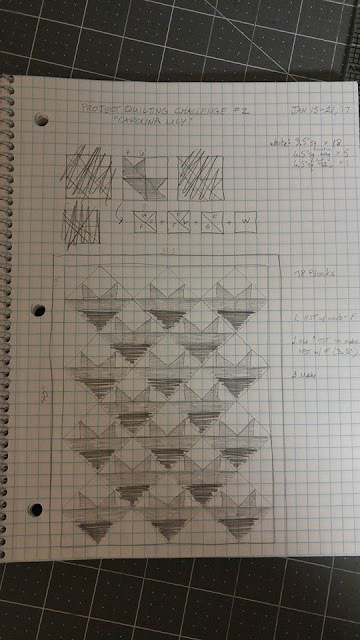 And so wonderful to make a quilt from design to binding! I love your color palette for this one - homey and adorable! It's lovely! Way to "make it work" and go with the flow instead of giving up! LOVE that attitude! 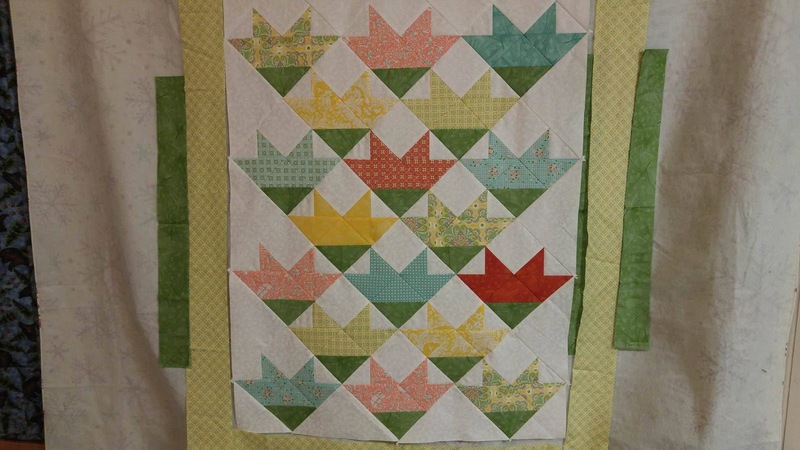 It´s a beautiful quilt! Love the colors! 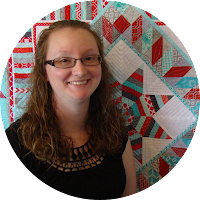 I need to tell you, in a round-about fashion, I came across your post about your very first quilt for Jocelyn, and then I clicked in on this post, and I must say you are amazing in your quilting journey! 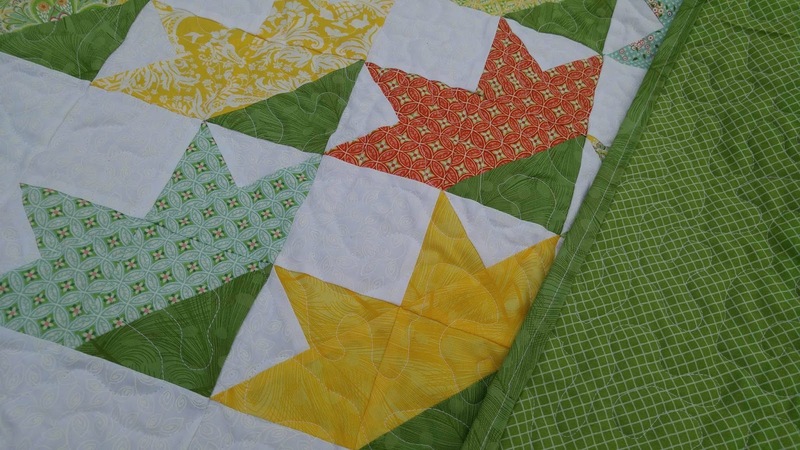 So much progress you have made over the years, and now you are paying it back with your charity quilts this year. 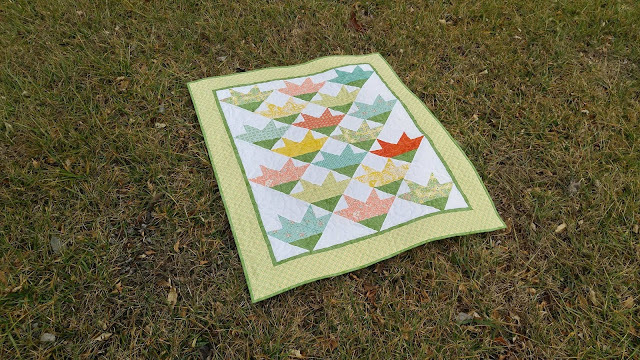 I love that you quickly came up with a plan for this quilt and followed through to a wonderful finish. Big smiles here for you! Keep enjoying your journey!